Direct trains to London St Pancras in just 30 minutes! Eaton Green heights has something for everyone, whether you are just starting out and looking for a place close to town, or you're looking for a substantial family home close to outstanding schools. And with a choice of one to four bedroom houses and apartments available, you're sure to find the perfect place to call your own. These superb homes in Luton are within walking distance of the station, with trains to London St Pancras in under half an hour, and conveniently close to the airport too for both business and holiday flights. It's an exciting time to live, work and invest in Luton, with huge plans to regenerate the town already underway. Earlier this year, Luton Borough Council announced its 20-year framework that will see Luton transformed thanks to a £1.5bn inward investment programme. Investment into the area will see major developments that will attract new businesses, creating thousands of new jobs, and will also see the regeneration of major shopping and transport facilities. Such positive growth expected over a number of years, along with the superb location and excellent transport infrastructure, makes buying a new home in Luton the perfect move. With so much to offer for so many people, Eaton Green heights is bound to prove popular, so register you interest now to be sure of all the very latest news. For your day to day needs, there is a Tesco Express close to the development on Eaton Green Road, with the Asda Luton Superstore just a little further away for your weekly shop. For doctors, register with Castle Street Surgery (sat nav LU1 3AG, call, and for dentists try Luton Dental Practice on King Street (sat nav LU1 2DP, call . Luton has a rich cultural mix, giving it some excellent restaurants to choose from in the town centre, all just a short walk from the development. Trip Advisor recommends Stopsley Cuisine, Nakorn Thai, Jay Raj and Papa j's Indian Tapas for Asian flavours, along with Monna Lisa, Villa Ada and La Trattoria for Italian. The Frog and Rhubarb, the White Horse and The Brache are known for their pub grub, while Moziah's offers something decidedly different with the taste of Jamaican and Caribbean food. There is a fine selection of schools within easy reach of Eaton Green Heights, including the Ofsted 'outstanding' rated schools Crawley Green Infants, Challney High School for Boys and Denbigh High School, which is rated in the top 100 non-selective state schools in the country. Luton has excellent further and higher education provision, including Barnfield College, Luton 6th Form Centre and a large campus of the University of Bedfordshire, which offers a wide range of academic and vocational courses to help further your career. With the Chilterns Area of Outstanding Natural Beauty right on your doorstep, it's easy to escape the fast paced life of Luton and London for the peace and quiet of the countryside. Closer to home, Luton has lots to offer for your leisure time, including the Galaxy Leisure Complex, which has a Cineworld cinema, ten pin bowling, a gym and even an indoor trampoline hall. Luton is also home to the Library Theatre on the 3rd floor of Luton Library, and the Hat Factory, which hosts comedy, music and theatre shows. Golfers can enjoy a challenging round at Stockwood Park or Griffin golf courses, and there are many different sports clubs and teams within the town. The Peel Retail Park is just across the road from the development, with a range of big name stores on offer. The recently refurbished town centre is based around The Mall, which has a host of high street names as well as local independents. Wigmore Shopping Centre to the east of town is also well worth a visit. Of course, for a more comprehensive shopping trip, London's exclusive boutiques and flagship Oxford Street stores are as little as half an hour away by train. Eaton Green heights could not be better placed for excellent commuter links. Luton Airport Parkway station is just a short walk away, with direct express services to St Pancras in as little as 24 minutes, or more regular services to Blackfriars in around three quarters of an hour. For road connections, the M1 is conveniently close, with J10 southbound and J11 northbound both just a short drive from the development. London is around 30 miles, Stevenage 14 miles, Aylesbury and Bedford both around 20 miles and St Albans around 11 miles. Luton Airport is just a short taxi ride away, offering flights across Europe and beyond as well as domestic flights. Choose Help To Sell and Redrow will sell your home for you, taking care of all the paperwork and even paying a contribution towards your estate agents' fees. We aim for a sale within just 6 weeks, so you can start enjoying your brand new Redrow home as soon as possible. We will arrange for 2-3 valuations to be carried out on your current home and agree a selling price with you. We will liaise with one of our approved Estate Agents to market your property for you. 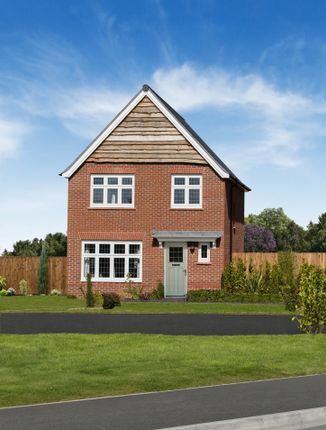 Once your home is sold, you are then ready to proceed with the purchase of your new Redrow home. Property descriptions and related information displayed on this page, with the exclusion of Running Costs data, are marketing materials provided by Redrow - Eaton Green Heights, and do not constitute property particulars. Please contact Redrow - Eaton Green Heights for full details and further information. The Running Costs data displayed on this page are provided by PrimeLocation to give an indication of potential running costs based on various data sources. PrimeLocation does not warrant or accept any responsibility for the accuracy or completeness of the property descriptions, related information or Running Costs data provided here.